Shop cranes are our specialty at Material Handling Solutions. 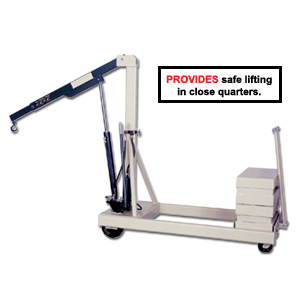 Our shop cranes provide safe lifting in small areas. These shop cranes are ideal for machine shops, injection mold shops and other industrial facilities. 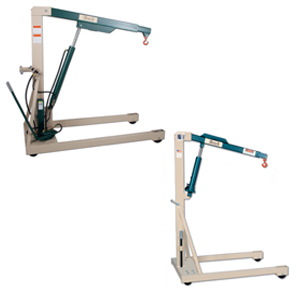 Our shop cranes feature a safety valve to prevent overloading and hydraulic lift is controlled by a hand pump. These cranes are equipped with extension boom, safety swivel hook, counterweights, steering handle and roller bearing wheels. Optional features on our shop cranes are: wheels, floor lock, power lift option featuring deep cycle battery and fully automatic charger and a remote pendant. 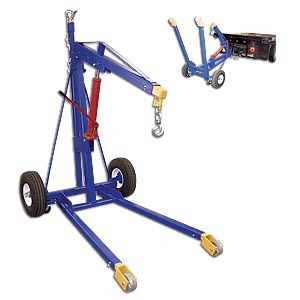 We carry different types of shop cranes such as counter balanced shop cranes and straddle cranes. We also carry a large line of cranes including jib cranes, gantry cranes and hoists. We offer many other types of material handling equipment. Please check out our large selection of various types of storage cabinets and warehouse storage racks to utilize your facilityâ€™s space to the fullest capacity. We have a huge inventory of pallet racks and we can usually ship any order within 96 hours. Call us toll free with any questions you may have and one of our specialists will help you find what you are looking for.